A modern day adaptation of the classic ‘Beauty and the Beast’ fairy tale, ‘Till the Last Petal Falls is an engrossing exploration of love, abuse, and enduring friendship. The book starts off fairly slow but is hard to put down towards the middle when the action gets thick. Without giving too much away, the book is about a young college graduate that moves in with a man that she has never met and after meeting his vivacious staff, and learning of his shocking secrets is left to make some of the hardest decisions of her life. ‘Till the Last Petal Falls is worth reading not only for the gripping plot but also for the underlying lessons. Although I was glued to the book after a while, I initially struggled with both the choice of character names and the dialogue seeming out of touch with modern speech at times. The common descriptions of the characters’ clothing at times seemed a bit too descriptive but there was an attention to detail throughout the book that was appreciated. The “Author Bio” section states that this is one of the books in a series mixing traditional fairy tales with modern issues and after reading this one, I can’t wait to read the rest. Thank you, Jelena! As a debut author, I know that I’m bound to make plenty of stylistic mistakes when it comes to description and what not- with the release of this first book, I’m really beginning to learn what is working and what will probably not work for the rest of the series- so it’s important for me to know what doesn’t work so I can start to tweak that now for future installments. This has given me plenty to think about in terms of To Dwell in Dreams. Thank you for reading, and taking a chance on a new author like me- I’m glad you liked it overall! Want an Autographed Copy of ‘Till the Last Petal Falls? If you order your copy of ‘Till the Last Petal Falls directly from me, I will autograph it for you. Just click here and enter ‘Autographed Copy’ as your subject line, then denote how many copies, and to whom the copies should be addressed. The cost for an autographed copy of ‘Till the Last Petal Falls remains the same as any other ($16.95 for the paperback, still waiting for the eBook to be released), though shipping rates will apply. If you haven’t thought about getting a copy of ‘Till the Last Petal Falls, why not check out this video trailer? 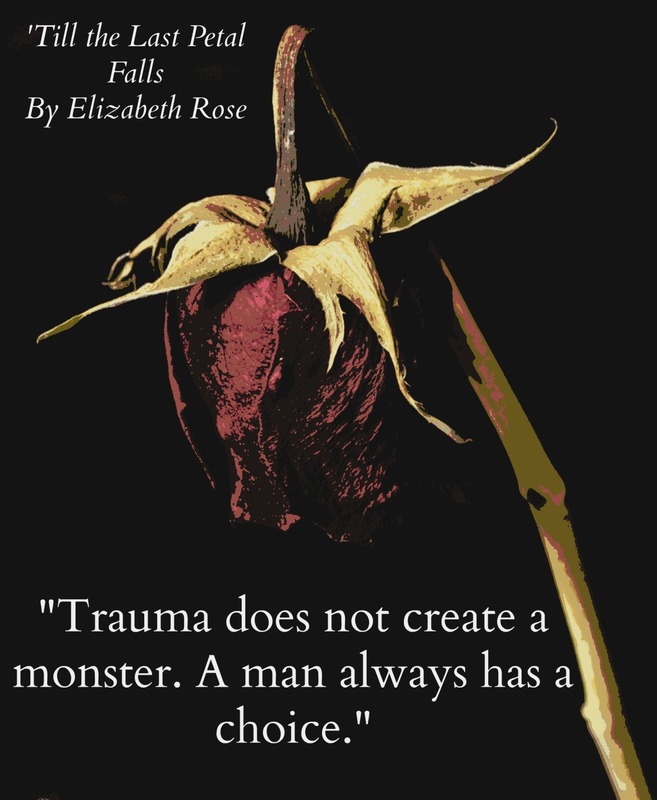 10% of all author royalties are donated to battered women’s shelters in Colorado. So today I went on a bit of a blitz updating my social media streams. After adding Pinterest to my line of connections to the world, I decided I needed to go back and update many of my current streams. I’ve now fixed up the websites quite a bit, and now I’ve finally created a new Tumblr that is all on its own- completely unaffiliated with my personal blog, I can now follow and connect to other Tumblr blogs as Elizabeth , instead of as a branch of a different blog. I will keep my old tumblr up for a short while, just to let current followers switch over, but hopefully this will enable me to connect with people in more of a straight-foward, unencumbered way.